Creaks and squeaks on staircases are generally the result of the different timber parts being loose and rubbing together. In the vast majority of cases the looseness does not affect the safety of people using the stairs but the creaks and squeaks can be irritating. Ideally you need access to under the staircase to carry out repairs, however this is not always possible; the underside may be obscured by plasterboard or another type of covering. Where the underside of the staircase cannot be accessed, repairs can be made from above the treads. To determine which steps are causing the creaks and squeaks, with someone under the staircase, another person should go up the stairs, pausing on each step and a note made whether that particular step is noisy. Once all the noisy treads have been identified, repair can commence. Traditionally the treads and risers were held in place in the stringers (side timbers) by timber wedges and with two or three triangular timber blocks holding the front of the treads to the top of the risers. Modern, mass produced staircases do not use side wedges but use additional timber blocks to secure the treads and risers to the stringers instead. Repairing treads from under the staircase. 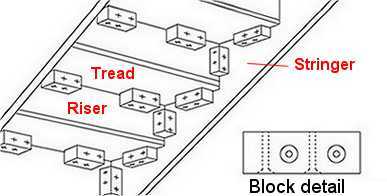 The method of curing the squeaks and creaks will depend upon whether wedges or blocks are used to secure the treads and risers to the stringers. Use a chisel to remove loose wedges, try to take care as it may be possible to reuse the wedges. If the wedges have been loose for a long period of time, they may have become worn, in which case, cut new wedges from hardwood. If the existing wedges can be reused, clean any glue off of them using sandpaper. Apply a good quality woodworking glue to the wedge joints and knock the wedges home between the stringers and riser/tread. NOTE that the vertical wedges (holding a riser in place), need to be fitted first, and the bottoms trimmed level with the treads before the horizontal (tread) wedge can be fitted. As well as the side wedges, the blocks holding the tread to the risers can also become loose. These blocks are normally triangular, however during a repair it is often easier to use 10 to 15cm (4 to 6 inch) long pieces of 25 to 50mm (1 to 2 inches) square softwood timber, 4 holes can be drilled and countersunk (as illustrated) to accommodate suitable screws so that the blocks can be both glued and screwed. Remove the old block if they are 'holding on'. Clean off any glue from the backs of the treads and risers, apply glue to the blocks and secure them using suitable screws. NOTE: Check the thickness of the treads and risers and select a length of screw such that it does not protrude through the upper surface of the treads or risers. Modern, mass produced staircases tend to use blocks to hold the treads and risers to the stringers, these blocks are normally triangular, however during a repair it is often easier to use 10 to 15cm (4 to 6 inch) long pieces of 25 to 50mm (1 to 2 inches) square softwood timber, 4 holes can be drilled and countersunk (as illustrated) to accommodate suitable screws so that the blocks can be both glued and screwed. Remove the old block if they are 'holding on'. Clean off any glue from the backs of the treads and risers, apply glue to the blocks and secure using suitable screws. NOTE: Check the thickness of the treads, risers and stringers and select a length of screw such that it does not protrude through the upper surface of the treads or risers or through any exposed stringer side. . Replacing the blocks between the treads and risers is as described for 'traditional' style staircases above.